Would you be willing to let your smartphone’s location (any by extension, your location) be tracked inside a store if it meant better access to product information and deals? That’s exactly the idea behind Apple’s new opt-in iBeacon technology. According to a report by the Associated Press, Apple has begun rolling out the tech to all of its 254 U.S. retail locations. Testing out the new iBeacon technology is as easy as installing an app and visiting an Apple Store location. Download the Apple Store app to your iPhone via the Apple App Store. 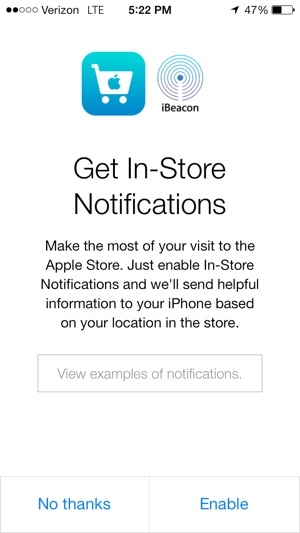 You’ll need to give the app the OK to use your current location and to send you push notifications when requested, and you’ll need to enable in-store notifications when prompted as well. You’ll also need to have your Bluetooth enabled when you walk into the store, and your phone will need to be upgraded to the iOS 7 operating system. Note that these permissions are reversible – you can change your mind about being tracked at a later time, if you'd like. Apple isn’t the only retail store testing out iBeacon location-tracking technology this holiday season. Just last month, department store chain Macy’s announced it would be embracing a similar ShopBeacon service that offers location-specific discounts and recommendations. JC Penney and Major League Baseball also offer location-tracking services. The key seems to be letting customers know and voluntarily opt-in as Nordstrom's learned earlier this year.